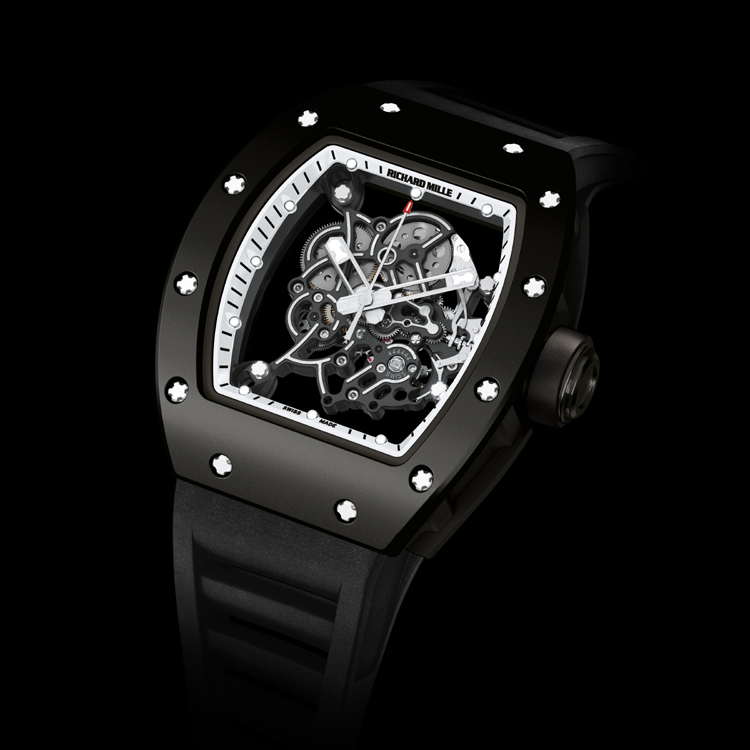 News: Richard Mille Introduces the RM055 Bubba Watson Limited Edition for the Americas. 30-Pieces Available of Each Red Drive and White Drive. Richard Mille expands his line of watches created in collaboration with Bubba Watson, the PGA golfer with the longest drive on the tour, with the introduction of two new limited edition versions of the RM055 available exclusively in North and South America. All of the previous watches created with Bubba Watson—RM038 Tourbillon Bubba Watson, RM038 Tourbillon Victory Watch, and RM055 Bubba Watson—feature stark white cases, bezels and straps. The new limited editions take a 180-degree turn, and are recognizable for their all-black cases and straps with few, bright details. A red flange forms a colorful frame around the skeletonized manual-wound movement of the RM055 Bubba Watson Red Drive limited edition, while a white flange provides a halo around the RM055 Bubba Watson White Drive limited edition’s movement. Both timepieces feature a case made from black rubberized grade-5 titanium, and a bezel constructed from black ceramic. A black DLC titanium and rubber crown, black rubber strap and black PVD- and Titalyt-treated movement complete the stealth look of the watches. Inside the case of each RM055 beats the caliber RMUL2, which is capable of withstanding accelerations of over 500 Gs, allowing it to perform on the wrist of a golfer with a massive drive. The movement is equipped with a variable-inertia balance wheel, which ensures reliability in the event of impacts and during assembly and dismantling, thus improving the long-term accuracy of the timepiece. The regulator index is eliminated, and a more accurate and repeatable inertia adjustment is possible thanks to four small adjustable weights located directly on the balance wheel. The double barrel mechanism helps to improve and equalize long-term torque stability: This is achieved by dispersing the stored energy within two winding barrels, equalizing torque as well as reducing pressure and friction on the bearings and pivots, resulting in improved long-term performance. The distinct construction of the RM055’s case is designed to meet the demanding requirements of sportsmen. The case middle and back are in grade 5 titanium with a protective black rubber casing. This rubber is injected at high pressure around the titanium components, thus insulating the movement from all vibrations. This special surface treatment also makes the watch very comfortable to wear. Richard Mille will produce 30 examples of the RM055 Bubba Watson Red Drive and 30 examples of the RM055 Bubba Watson White Drive. The limited editions are available at authorized Richard Mille retailers in North and South America, as well as the Richard Mille boutiques in Beverly Hills and Las Vegas. Sticker Price $115,000 USD. For more info on Richard Mille click here. Posted on October 16, 2013 by Editor & Publisher and filed under Richard Mille, News and tagged Richard Mille RM055 Bubba Watson Limited Edition Richard Mille Bubba Watson Red Driver Richard Mille Bubba Watson White Driver.